So they know I’m there to party! Kathleen and Chris’ wedding is this weekend. 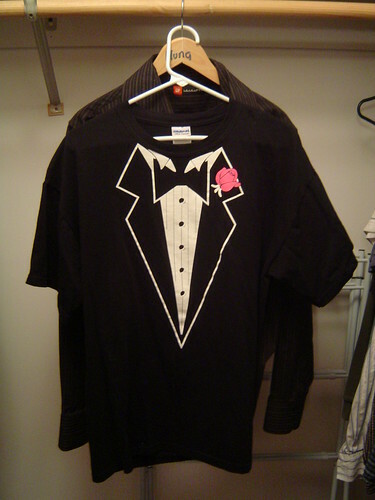 I “promised” Kathleen I would wear a tuxedo t-shirt for the joyous occasion, by the way I’m in the wedding. OK, so I am not wearing it to the wedding but I am wearing it to Chris’ bachelor party and I might have to cut the sleeves off before I get there. This entry was posted on September 18, 2008 at 2:24 am and is filed under News. You can follow any responses to this entry through the RSS 2.0 feed. You can leave a response, or trackback from your own site.